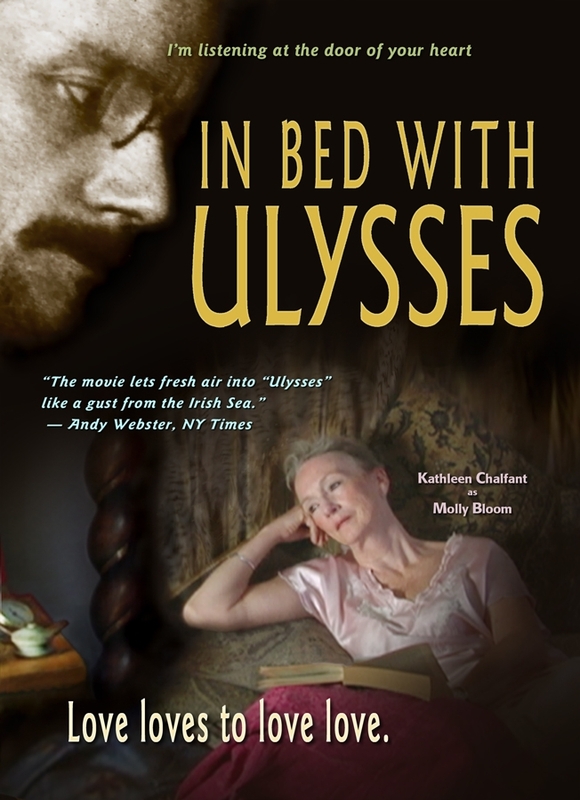 At once maddening and fascinating, Alan Adelson and Kate Taverna's documentary IN BED WITH ULYSSES takes on the task of presenting James Joyce's landmark masterpiece Ulysses as an easily approachable comic romp. Toward that end, they includes extensive footage of a dramatic reading of the novel, directed by Adelson and staged under the title “Bloom” at the Center for Jewish History in New York City, with imported Irish actors giving vivid voice to the multitude of Dublin denizens that Joyce immortalized in his pages. Hearing the words does provide a thread to guide one through the Daedalean maze of Joyce’s innovative language. Ulysses, however, might prove more daunting to the casual reader than the filmmakers seem to suggest, and this is but one of a number of serious flaws in what could have been a first-rate introduction to “the great novel no one has read.” Adelson and Laverna, in fact, preface their encomium with a sequence of interview snippets in which an array of average sorts admit that they've never read it, or that they’ve never heard of it, or the slender, half-blind genius who wrote it. It’s hard to imagine very many of them having a go at it. 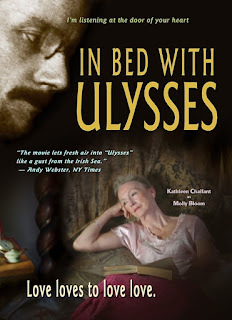 Where IN BED WITH ULYSSES succeeds is in the marvelous evocation of Dublin in 1904, and the maelstrom of Joyce's untidy life surrounding the book's creation. Ulysses takes place within the span of a single day, June 16, 1904, a date which Joyce fetishists celebrate as “Bloomsday.” Through rare film footage, still photographs, historical documents and contemporary interviews, Adelson and Laverna create a palpable tableau that conveys the visual and experiential sense of what Joyce dubbed (in the “Aeolus” chapter of Ulysses) “the heart of Hibernian metropolis,” just after the turn of the century. Adelson has chosen to narrate his own script, which may not have been the most felicitous decision. His speech is curiously slow, his voice adenoidal, and his statements often leadenly obvious. Filming on top of the Martello tower, for instance, where the novel opens (and where Joyce himself bunked for a few brief but significant days), all Adelson can think to say is, “What a place to feel the gift and wonder of literature!” Elsewhere, telling the story of James and Nora's first "date," Adelson naively exclaims, "She put her hand in Joyce's pants! That made a lasting impression on him." Very welcome is a bit from a filmed interview with Sylvia Beach, proprietess of the legendary Paris bookstore Shakespeare and Company, who dared publish Joyce's book in its entirety in the face of international disapprobation and censorship (copies of The Little Review that printed excerpts from Ulysses were famously seized and burned wholesale). Recalling those heady days in old age, Miss Beach is lively, intelligent and wry. Likewise, a visit to the Irish Jewish Center in Dublin proves enlightening, as its curator Raphael Siev discusses the tiny Jewish population of Ireland, and the climate of anti-Semitism active especially at the time of the novel, noting the notorious sermons preached in 1903 by Redemptorist Catholic priest Father John Creagh of Limerick, who accused the Jews of shedding Christian blood. His venomous words resulted in a boycott, often violent, of Jewish merchants, prompting an exodus of Jews from Ireland. The novel's central figure, Leopold Bloom (whose interior monologue forms most of the book), is a hereditary Jew who has converted to Christianity (prudently being baptized in both the Protestant and Catholic faiths), but he still experiences the slights and offenses of that bigotry. One wishes that more of the focus achieved here infused the rest of the documentary. Various Joyce scholars and biographers offer not much that is new or deeply insightful. One expert expresses surprise that Joyce's wife Nora, for instance, would stay with him in the face of his fantasies about cuckoldry and masochism, overlooking epistolary evidence that this was a gambit mutually (if tentatively, and, in Joyce’s case, not always comfortably) enjoyed by the couple. It also overlooks the presence on Joyce's bookshelves a number of volumes by Leopold von Sacher-Masoch, including Venus in Furs, which plays a large role in Ulysses' most freewheeling section, the famous “Circe” chapter, set in Dublin's red-light district. Nevertheless, IN BED WITH ULYSSES manages to redeem itself through the brilliant montage of its visual record, for which co-director and editor Kate Taverna must be given much of the credit. She has edited 23 documentaries since 1981, including The Trials of J. Robert Oppenheimer and Alan Adelson's only other documentary, Lodz Ghetto (1989), and her sure hand helps IN BED WITH ULYSSES succeed where it otherwise might have floundered. Mark Satola is a host and producer at WCLV 104.9 Classical FM - Ideastream.